As much as I do admire gargantuan formal flower arrangements bursting with exotic tropicals and fragrant petals, there is definitely something to be said for the simple and the small. 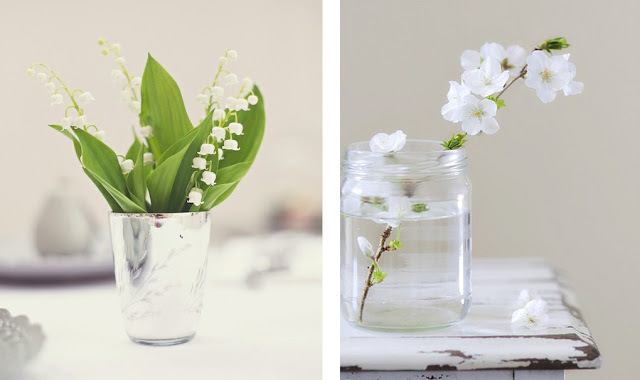 This time of year, especially, it is so nice to be able to brighten our rooms with little hits of spring in all our little corners: on the mantel, on the coffee table, on the nightstand or on the window sill. With most of the continent still firmly under Winter's thumb, venturing outdoors to snip a few sprigs of loveliness from the garden is rarely an option - the southern states excluded, of course. Florists carry a wide variety of flowers that many vendors will sell by the stem, or at least by the half-dozen. Once you've selected your favourites, choose a pretty vessel and arrange the stems casually to help impart a feeling of relaxation. Don't fuss with formality. The idea is to keep the arrangement as simple as possible. 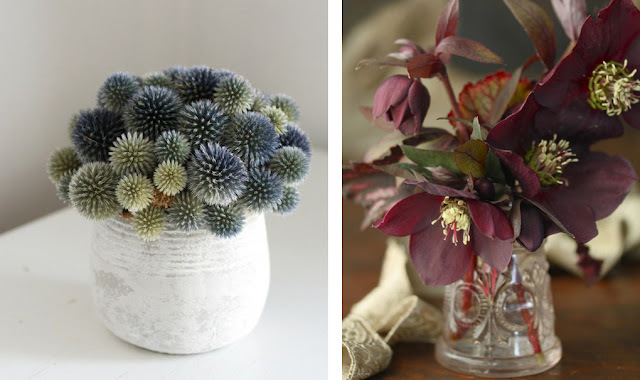 Below are some examples of pretty little arrangements of a single stem, or a single variety of flower or a single colour. I hope they inspire you to create your own little burst of spring indoors. Lily of the Valley (left) is a fragrant, delicate flower. One of my favourites. The stems look lovely in this mercury-glass vessel. On the right, a single apple tree branch, all in bloom, emerges from a plain glass jar, lending a subtle scent and an interesting shape. Not sure what these are on the left, but I love the spherical shape and the monochromatic palette. 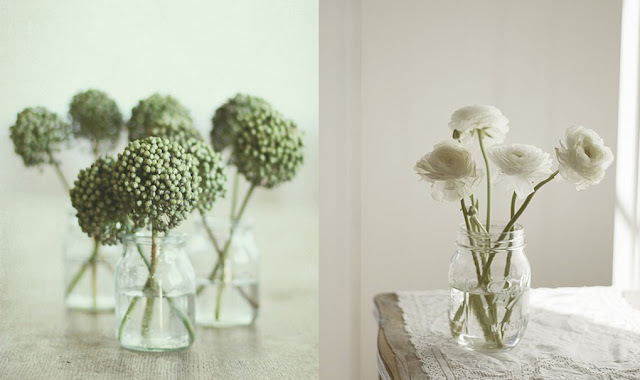 A trio of small glass jars is each filled with a trio of stems. They look terrific in a group like this, or you could place them in different rooms. On the right, white ranunculus bring a delicate and feminine touch to this pale, sunlit room. Thistle flowers on the left create a marvelous mound of texture in quiet shades of lavender and green. The vase used is a non-glazed ceramic pot. On the right, beautiful dark-red hellebores lend just a small dose of drama. Don't tell Madonna, but sprigs of Hydrangea are actually quite lovely, shown at left. A single stem in a glass milk jar looks almost treelike. 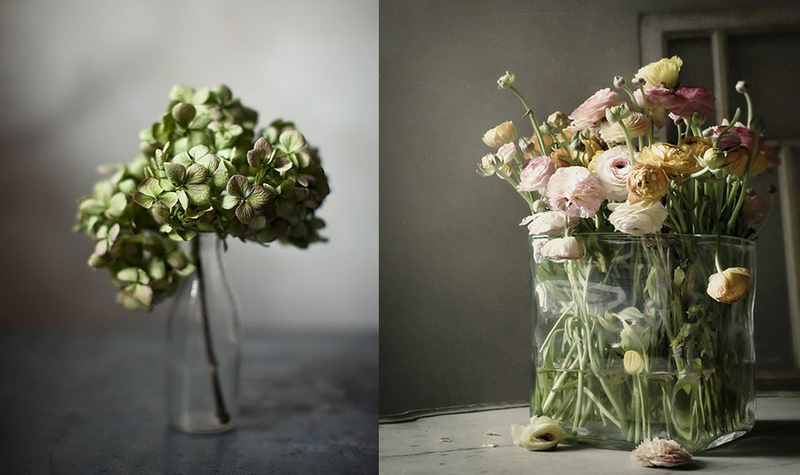 On the right, a large collection of ranunculus looks gorgeously wild in this very large glass canister. If you do live in a region that has an abundance of wildflowers this time of year, take good advantage of them. A blue glass jar on the left proffers a variety of summery wildflowers. On the right, the blossoming branch of a fruit tree brings certain drama to this rustic kitchen. 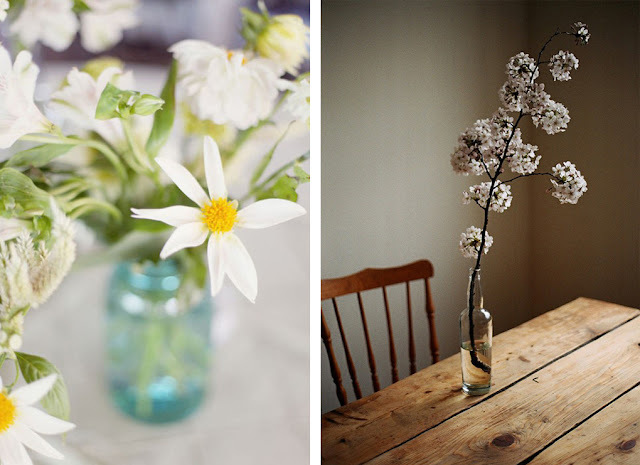 The glass bottle with its narrow shape is the perfect vase for it. The thistles are my favourite. I caved in and bought some daffodils for some winter cheer the other day, but I think a small arrangement of white flowers will be my next purchase. So pretty Andrew. This is so inspiring Andrew, I love flowers and I enjoy arranging them, I use a variety of objects. Beautiful selection of cards on your favorite stationers on Etsy! Thanks, ladies! I can't wait for spring, can you tell? I believe the flowers "to the left" the green spherical ones are a type of Allium which is a member of the onion family. I love them too, especially because the deer hate them! Thanks, Kristina. I thought it was allium, but wasn't sure.